Watch out, tourist attractions and outlet malls; Billy Miller has arrived, and he aims to bring a shot of adrenaline to the Myrtle Beach arts scene. With a personal mantra of PACE, or “Positive Attitudes Change Everything,” Miller creates much more than art. In addition to his award-winning abstract works in paint, drawing and digital media, Miller creates opportunity. 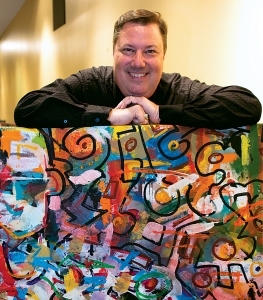 He employed his innovative artistic talents to create success first in his personal career, then in the Houston area where he opened his own studio, and now here in Myrtle Beach. Together with local established artists, Miller senses a change coming to the area’s artistic landscape, and he’s set to be a primary catalyst. 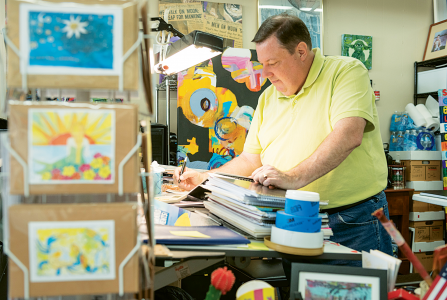 The William H. Miller studio on Main Street in Myrtle Beach is a welcoming haven that not only offers the sensory delights of a working studio, but aims to be a prototype for a revitalized downtown arts district. 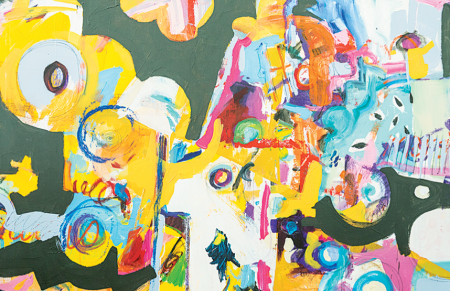 The stretched canvas that covers one wall is an abstract painting in progress, its vibrant colors brimming with promise and potential interpretation. Paintings, digital media, glass works, photography and greeting cards share the artists’ space with easels, shelves of paints and brushes and an industrial digital printer, while classical music drifts from speakers in the background. This place feels like art, and Miller is expanding its impact by building ties with other artists and establishing unique programs to draw patron support and energy. Miller has spent 18 prolific months living in the area. In addition to opening his studio in January 2015, he has been voted onto the Board of Trustees at the Franklin G. Burroughs-Simeon B. Chapin Art Museum and selected as a featured artist for the Collector’s Café 2016 Spring Art Show. He’s also participated in Lake City’s prestigious Art Fields competition and, in conjunction with local artists Sybil Alfano and Ernesto Hernandez, hosted the Art Happens exhibit at his studio and begun a Facebook group called Art Escape Creative Arts Group. This group has drawn 180 area artists to exchange news and information. Miller opened his first studio in Houston’s Washington Avenue Arts District in 2007, and he was instrumental in garnering support to build the area. The district expanded from Miller’s single warehouse in 2007 to five warehouses housing 400 artists in 2014. Houston Mayor Annise Parker declared June 30, 2014, William H. Miller Day to recognize his artistic contributions. “I wouldn’t be the artist I am today without the experience and collaboration of such talented artists that I worked alongside in Houston,” Miller says. Miller has already begun applying his organizational talents locally by offering classes in his studio and organizing the Main Street 10, a consortium of local artists that share his studio space.